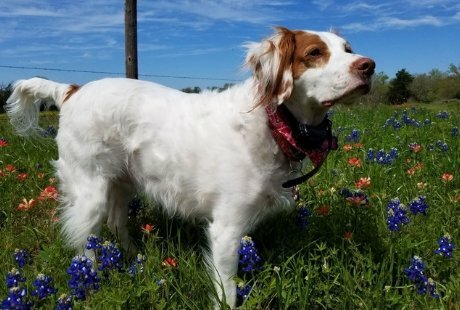 Spring has sprung in Texas … happy news for your Brittanys, who will be spending more time sniffing and romping and rolling in the great outdoors. While longer days and warmer days make us happy, they can bring some risks to our Brittanys. Every seasonal change can bring dangers, but the Spring season presents some specific risks that can be easily addressed as long as we Brittany owners know what to look for. Be aware of fire ants AND what you use to kill them (both can be harmful to your Brittany). Fire ant bites can be a big problem for dogs. According to a recent survey completed by veterinarians, small animals and pets are treated more frequently than any other type of animal for fire ant related health injuries. Fire ants build soft piles of soil, and when their pile is disturbed, they come out aggressively and start stinging and biting. Fire ants are the epitome of the term “small but terrible.” When they attack an invader of their mound, fire ants inject an oily alkaloid venom that packs a powerful punch. Within 24 hours from the fire ant bite, a white pistule then forms within the bite marks, which can get infected when scratched. In the case of humans, fire ant bites can cause a variety of side effects such as chest pains, nausea and slurred speech. Since it is a lot harder to detect whether your pet has had a severe reaction to the fire ant bites it had been subjected to, it is imperative to rush your pet to your local vet. They will be able to properly treat the bites and prescribe any needed medication. Dogs are susceptible to infection because they have a tendency to scratch and bite the pustules. In order to keep your dog safe, it is best to treat the bites as soon as possible. If fire ants have attacked your Brittany, get them out from the fire ant mound as quickly as possible. Once their mound is disturbed, fire ants attack the invader by the thousands. Once you have placed your pets in a safe distance, brush off the fire ants that you see on your pet’s body. Make sure that you are wearing protective clothing when doing this as the fire ants can immediately attack you once you try to brush them off. 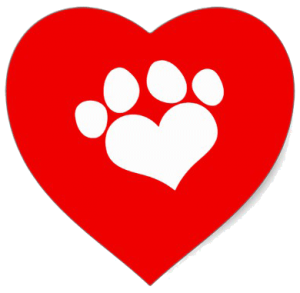 Do not attempt to spray your pet with water when trying to remove the fire ants on its body. This would cause the fire ants to continuously bite your pet as they try to cling onto it. Fire ants are commonly attracted to pet food. They can blanket a food bowl, making it impossible for pets to eat. When disturbed, mounds produce thousands of stinging fire ants, creating a potentially dangerous situation for pets while playing, running, or digging near an ant mound. If you’re planting, remember some plants are toxic for dogs, including azalea, chrysanthemum, daffodil, rhododendron, sago palm and tulip. Consumption of these plants can lead to kidney failure in animals. The ASPCA provides a complete list of toxic plants with images. While the deadly chemical is most often associated with Winter, many vets see just as many antifreeze poisonings in the Spring. Whether it’s due to shade tree mechanics cleaning their radiators, unidentified leaks, ethylene glycol–based antifreeze winds up in driveways and streets where it tastes sweet to dogs and, even in tiny amounts, may cause sudden kidney failure. FYI, don’t fill the base of your portable basketball hoop with antifreeze, use water instead. Foxtail Grasses are another not-so-fabulous right of Spring. Foxtail grass grows abundantly throughout the U.S. It, like other grains, is sometimes grown as a food crop. Foxtails also appear in the wild. You have probably even picked the hair-like grains out of your socks after a hike. 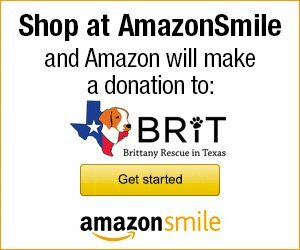 Something to be aware of if you take your Brittany out into the field. Foxtail grass, which sprouts in abundance this time of year, has microscopic barbules along their surface. Once they catch on animals’ fur, they can become lodged in their skin (most often in the webbing between the toes), ear canal, or nose. Foxtails cause extreme discomfort and often lead to bleeding, infection, and, in the case of ear canal migration, ruptured ear drums. If swallowed, foxtails can lodge in the throat, causing swelling and infection. If accidentally inhaled, they can cause serious damage and infection in the airways or lungs. Get outdoors and enjoy the season, just remain aware of your Brittany’s surroundings. Changes in the environment can be stimulating to them, but new smells in the yard or garden can also be harmful. Simply take extra precautions: be sure all chemicals are completely out of your pets’ reach, and remove foxtails as soon as you see them on your Brittany.